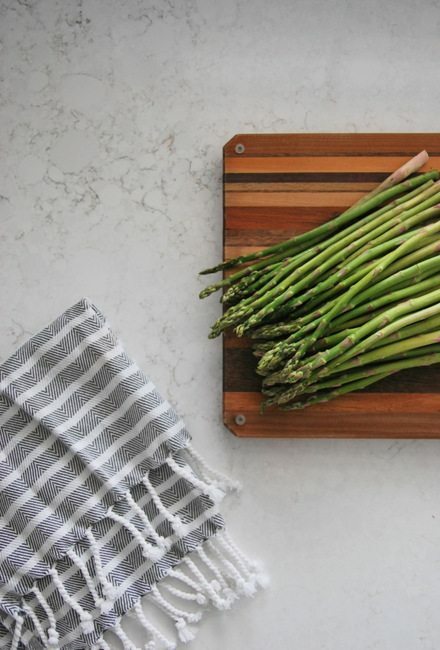 Let’s chat kitchen countertops. 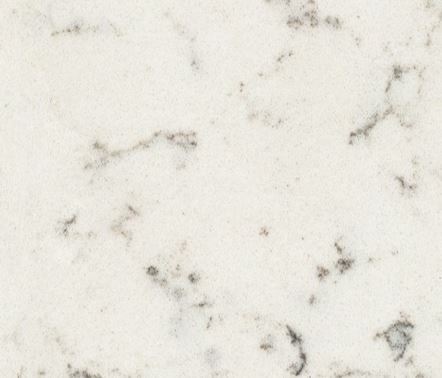 Specifically, quartz that look like marble – that gorgeous gray and white carrara marble. Happily, what we ended up with was the kitchen of my dreams! Copy the look with these budget-friendly finds! First step in any kitchen counter decision is material choice. 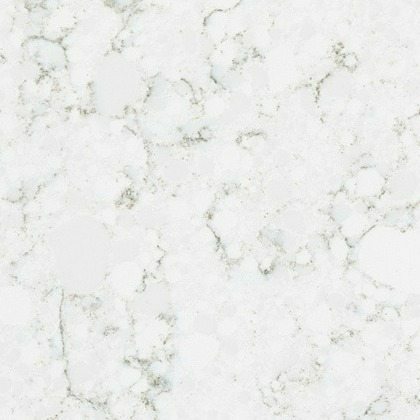 There are so many options these days when it comes to counters – laminate, granite, quartz, quartzite, corian, marble, butcher block, concrete, soapstone, etc – and each have their advantages and disadvantages. We were constantly weighing looks vs. price vs. longevity and maintenance. Depending on your budget, needs of your household, and your style preference, your choice here is going to vary. 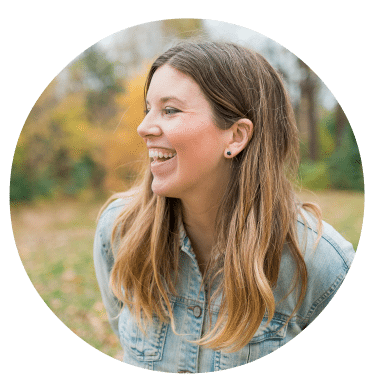 I don’t think there are any “bad” choices – just different options to suit different needs. 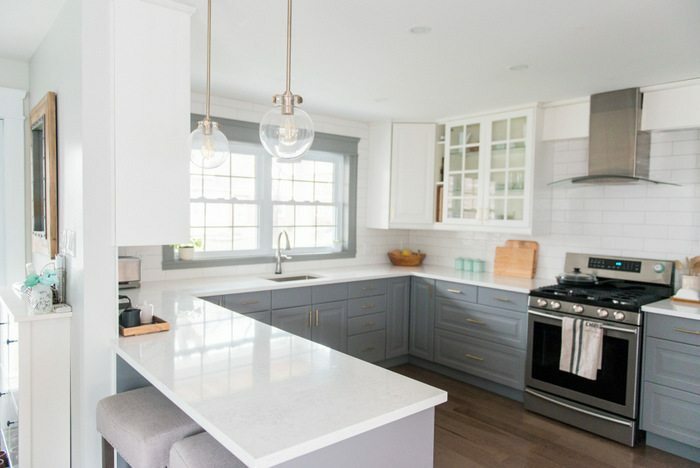 I wanted something that was light – largely white with a bit of grey – to tie the two colours in the cabinetry together. 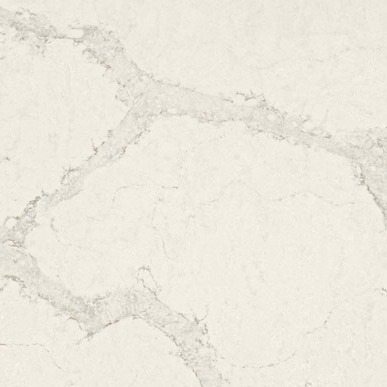 I like the veining that you find in stone, but didn’t want it to be overly busy. We are a young family and only just in the beginning of likely several decades of fairly major wear and tear on our house. We wanted something that would stand up to kids in the kitchen and would be as maintenance free as possible. I didn’t want to be having to wipe down a spill a split second after it happened because I was worried about staining, or have to seal the counters every year. I’m a low maintenance kind of gal. To get what we wanted in a) and b) above, we knew we would have to shell out some serious coin. 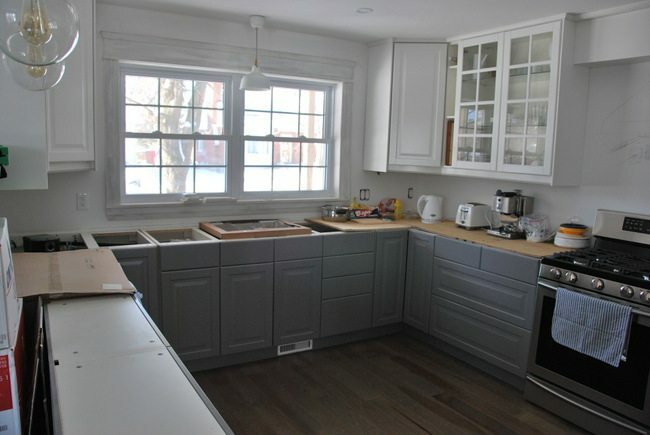 In our overall kitchen scheme, we decided to save on cabinetry (IKEA) and backsplash (subway tile) in order to spend more of our budget on countertops. After considering all of that, the choice to go with a quartz was pretty clear. 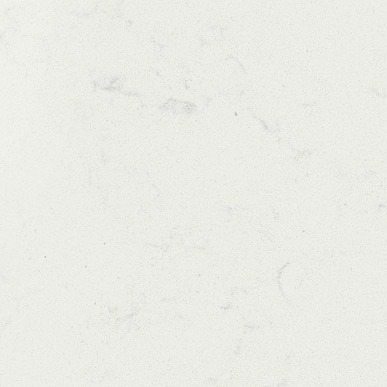 It is an engineered stone, so you can get that look of veining as you would in a natural stone, but it is super durable and maintenance free. 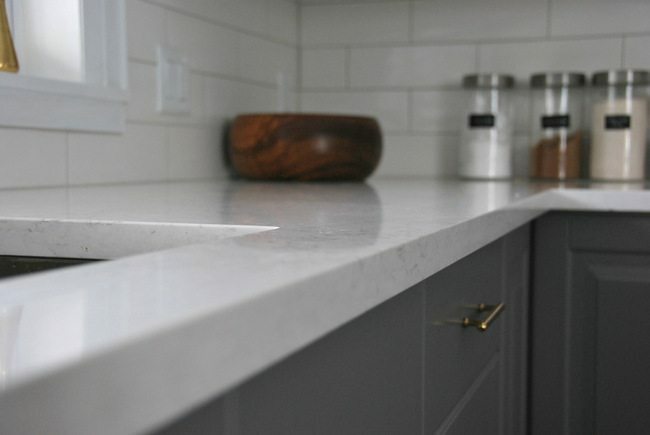 No having to seal it annually like granite, or worry about spills and staining like a marble. 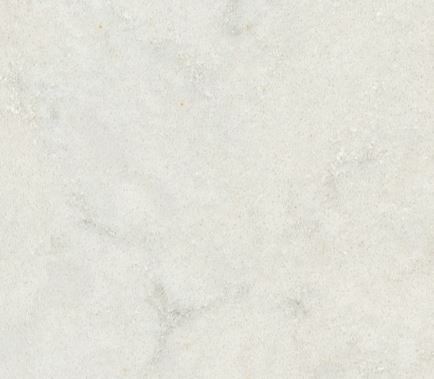 There is absolutely nothing wrong with granite or marble – but we were just trying to choose what would work best FOR US. 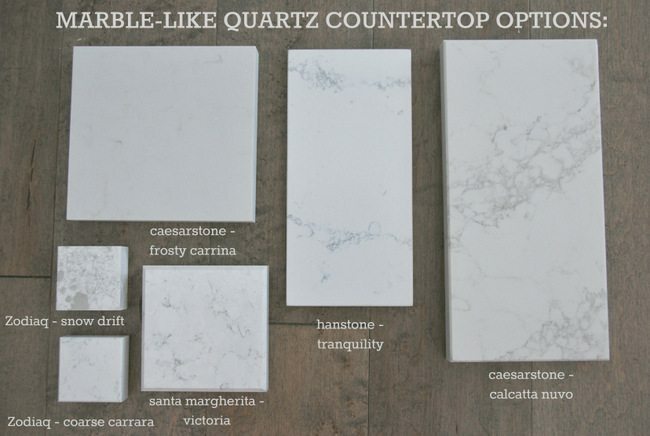 Once you get into the world of quartz manufacturers, there are tons of choices. Maybe too many, as it makes the decision process hard! 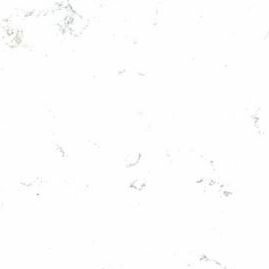 I knew I wanted something that had white and grey in it like a marble, so I went out and started collecting samples and looking at slabs in person where possible. If I even moderately liked what I saw, I brought samples home with me so that I could hold them up to my cabinetry in the light of my kitchen. There is nothing better than seeing something in your own space – way different than in a showroom under fluorescent lighting. 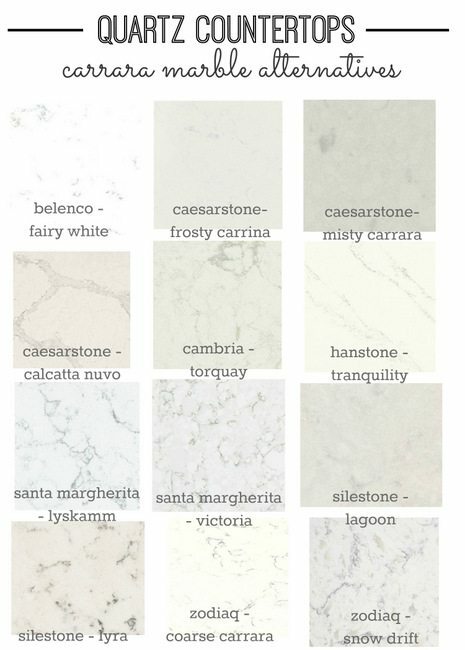 If you are looking for a quartz that has grey and white in it and looks similar to carrara marble, these are the ones you might want to check out (this list is current as of March 2015 – manufacturers are always adding new colours). 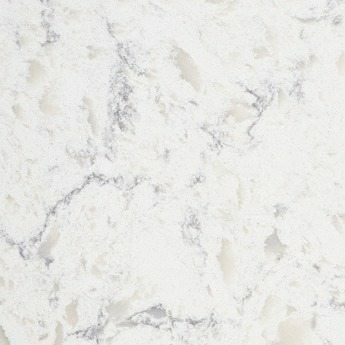 I have included bigger screenshots of each countertop option below, although seeing it on the computer definitely isn’t quite the same as going and grabbing an actual sample piece. After checking each one of those out in person, I narrowed it down to 6 for our kitchen. They all had a fair bit of white in them, and didn’t have the flecks or speckled look that you often find in quartz. 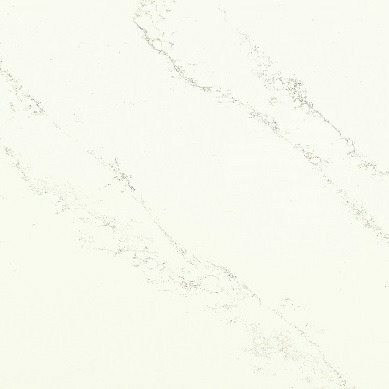 It’s totally a personal preference thing – I just don’t like the little flecks and prefer a smooth look with grey veining. At this point, I got detailed quotes for each one of these materials. All of these manufacturers are reputable, so price would definitely help us narrow it down. To be honest, I could have been persuaded to go for any of these. 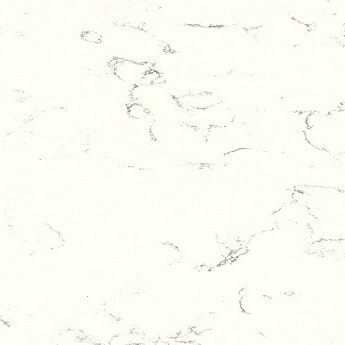 Definitely the front runner for me initially was the Calcatta Nuvo as I thought the veining was just so striking and the grey and white were perfect in our kitchen. And of course, it was the one that was by far the most expensive. Isn’t that always how it is? Cut from the list. The Frosty Carrina was second most expensive and I wasn’t thrilled by how little veining there was in it, and it was predominantly grey rather than white, so it was nixed. Santa Margherita Victoria. Winner winner! I should also mention that I went out and saw a big slab of it in person before putting in my order. It’s such a major decision that seeing it on a small scale and on the computer wasn’t enough. I often found that I saw an option on the computer that looked ahhh-mazing, and then in person it looked so different from what I had imagined. So word of warning — always go in person! Basically as soon as the installers were bringing the slab through the door, I knew it was exactly the right decision. The counters are bright and read like a nice white from a distance. 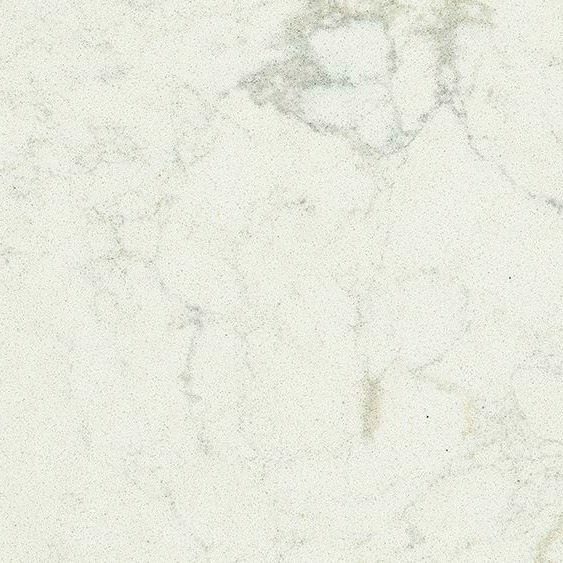 But when you get close up, the veining detail adds so much interest, without overtaking the whole counter. I went with a squared edge profile to keep it simple and clean. They feel solid, smooth, and seriously lovely. Oh, and the seams (we have 3 in our corners) are barely noticeable. I’m totally in love. Bigtime. Going with brushed or polished brass both totally work and look amazing on both the gray and white cabinets. Our exact pulls aren’t available online anymore, but these are similar and budget-friendly! This was done just before IKEA changed to their Sektion kitchens, so our exact cabinet styles were discontinued. The Bobdyn cabinetry would be the new version though (they still have gray!). Want to see the whole before and after? 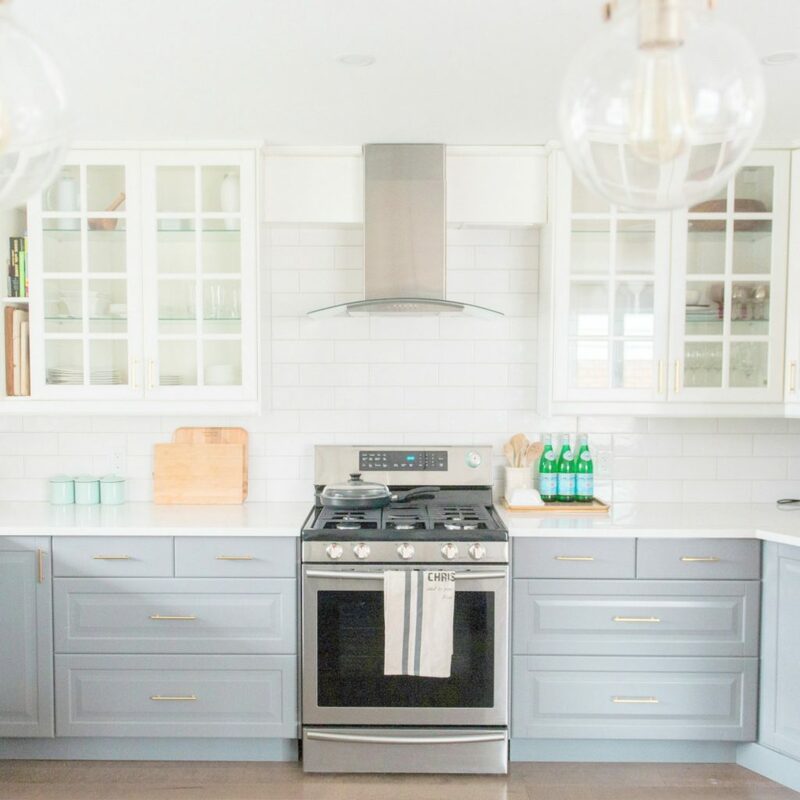 You can check out the whole kitchen before & after reveal for waaaayy more photos! 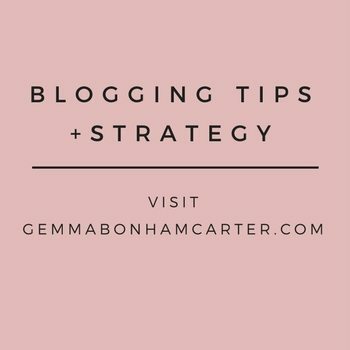 Hi Gemma! I love this kitchen! I know this is an older post but it’s my inspiration for our renovation. 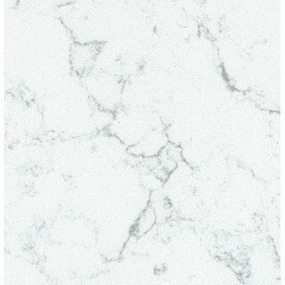 We flooded from Hurricane Harvey and are going to use a pure white quartz counter, white subway tile backsplash, and white cabinets. I’d love to know the color for your lower cabinets – I love it! 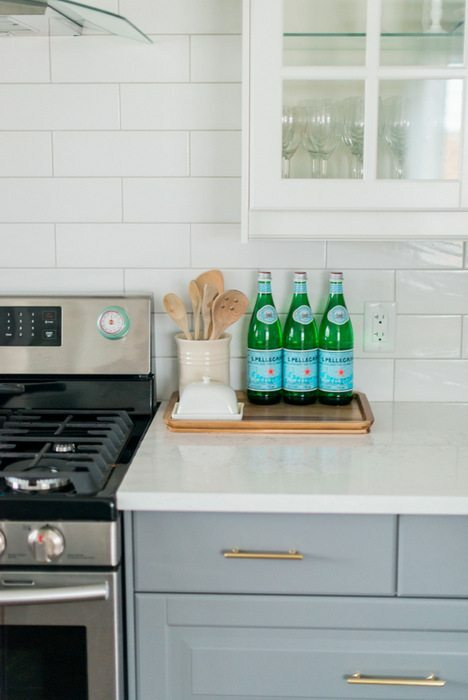 Also, is the grout on the tile grey? What type of grey did you use? Hi Maggi. The lower cabinets are the grey from IKEA! 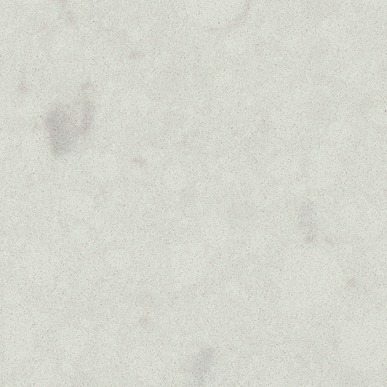 And the grout is grey – it’s called Silverado. 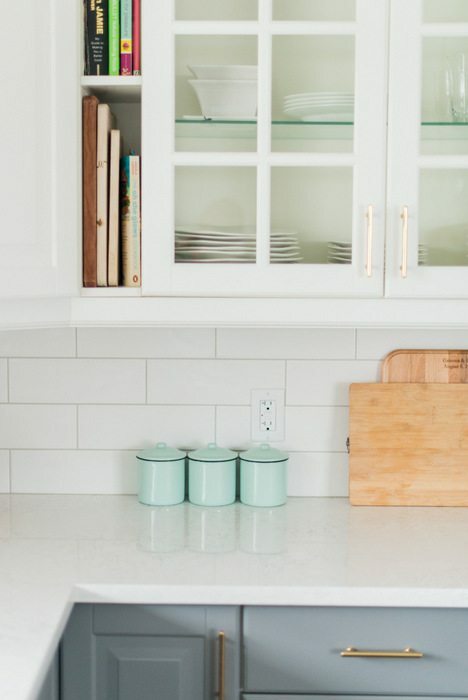 Really good article and I love the color of the cabinets ! Such a pretty shade of blue and the gold hardware ads a nice contrast! Beautiful! Your quartz is very similar to what we picked. All the reasons you gave for not going with granite or marble were ours also. Your advice to go see the selection in person is so right on. Our designer gave me a sample and I didn’t like it. It kind of grew on me but when I saw it on-line, I almost cried it was as awful as I first thought. I asked where we could go to see some slabs and saw his pick first thing. So much more awful in person! The other slabs there were wonderful, exactly what I wanted. So many to choose from. The elimination process was hard, but we narrowed it down to 2 , with price finally being the deciding factor. Love it! Great advice, great article. Thanks!! Could you please tell me more about your floor? What type is it? What color? I am afraid my wood floors might not go with grey cabinets but yours look great!